At Universal City, California, on December 12, 1972, MCA Inc. presented a star-filled video disc entertainment at the first public showing of its new DISCO-VISION system. More than 300 press and industry executives viewed color and black-and-white excerpts from Universal's vast film library shown via DISCO-VISION on the screens of a variety of home television sets. The presentations were made to approximately 150 members of the press at 11:30am and a similar number of entertainment, retailing and electronic manufacturing executives at 4pm at Universal's Stage 24. In addition to ending years of industry speculation on when and how the showing of films on home television sets could be achieved at popular prices, the demonstrations that day took on additional stature with the attendance of the MCA Inc. Board of Directors in advance of a regular board meeting. Lew R. Wasserman, President and Chief Executive Officer of MCA Inc., welcomed the guests at both viewings "to share in MCA's progress report on the research and development of our company's new technology." The demonstration, he pointed out, was not a consumer introduction. The DISCO-VISION presentation included seven minutes of scenes from 22 musicals, comedies and dramatic motion pictures from Universal's immense film library of more than 11,000 titles, encompassing the years 1930 to 1972, and featuring many of the top stars of those years. The audiences saw the DISCO-VISION program on brand-name standard home TV receivers. We believe we've achieved the ultimate concept in home entertainment and information storage and retrieval systems, and that both the hardware and the software will be sold to the consumer at popular prices. These replicated discs are capable of storing 40 billion bits of information permitting up to 40 minutes of playing time per side. In fact, it's possible to store the Social Security number of every person in the United States on just one side of one disc! You'll view the disc - one of which I'm holding and the other of which you see on the player there - today on standard-brand TV sets which we purchased from local retailers. MCA DISCO-VISION is the first optically-read system to be demonstrated from a replicated disc. We are not working from a master. What you'll see is an end-product demonstration of the disc itself. MCA DISCO-VISION is the first disc system to demonstrate more than five minutes of programming. Today, we're highlighting the entertainment aspects of DISCO-VISION, although there are numerous additional applications for this technology, giving DISCO-VISION an enormous range of business, educational and other uses. The replicated demonstration disc you'll see is a composite of scenes from 22 Universal films - both color and black-and-white, ranging from 1930 to 1972 productions. These subjects span the entire historical spectrum of changing film technology, from the old black-and white nitrate negatives of the 30's to Technicolor's three-stripe nitrate negatives, culminating in Kodak's color negative of the 70's. The ability to produce a balanced uniform print from this heterogeneous mixture of widely divergent film sources, each with its own different color balance and contrasts, and to transfer each to our replicated disc, confirms the discs versatility. 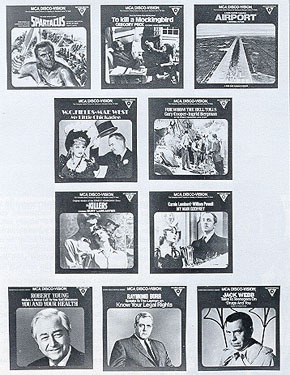 Both the seven-minute running time and the selection of the 22 titles were arbitrary decisions. We could just as well have chosen 8, 10, 15 or 20 minutes of programming. But it seemed to us that seven minutes constituted a truly representative sample. However, those of you who would like to view a disc with 20 minutes or more of recorded information may contact us after the demonstration and we'll be happy to arrange in-lab group viewings. SRI - Stanford Research Institute - is making a comprehensive, in-depth study of the manufacturing, marketing and distribution fundamentals for us. We prefer to await their recommendations before making any definitive decisions in those areas. However, since we do want to share our knowledge, ideas and all available information with you to the utmost of our ability - Kent Broadbent, Vice President of MCA DISCO-VISION, Inc., and director of R & D on this project, and I - both of us - will be available after the demonstration should you have further inquiries. And now, I'm very proud to present...MCA's DISCO-VISION! There then followed the actual demonstration, in which a standard "for sale" replicated DISCO-VISION mylar disc (not a master) was used to project clips from 22 films (old and new, black and white and color) onto the tubes of six off-the-shelf standard TV receivers, each of which bore the brand name of a different manufacturer. Members of the select press and VIP audience present were obviously much impressed and unanimous in their praise of the system's clarity, sharpness and fidelity of color rendition. At the close of the formal presentation, guests visited a decorated room setting showing the DISCO-VISION system as part of the home entertainment center. Also on view were sample DISCO-VISION albums, representing a variety of Universal products (full-length features, documentaries, cartoons, short subjects, educational and cultural films, etc.) which the company anticipates it will market on the video disc, as well as several illustrative samples of subjects which will be produced especially for DISCO-VISION. Room setting illustrates the way the MCA DISCO-VISION player unit will look atop a home television set. 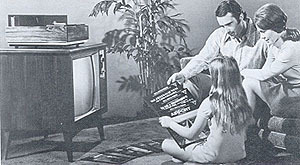 Model family is choosing a video disc album from an illustrative sampling of program material from Universal's film library. MCA DISCO-VISION is a new technology whereby a variety of information sources recorded on a thin, flexible video disc can be shown on standard home television screens by means of a disc changer/player attachment. The changer/player unit will provided a minimum of three hours or less and a maximum of 6-2/3 hours of unattended playing time. A single-disc player is also available. DISCO-VISION is a product of MCA Inc.'s research and development in the field of low-cost, high density audio-video information recording and storage. The DISCO-VISION playback unit is attached to the VHF antenna input terminals of any standard home television receiver and may be tuned to a channel which is not used for regular television programming. There is no pick-up stylus. The playback unit employs an optical system with a non physical contact, low-powered helium-neon laser read-out which picks up the images and relays them electronically to the TV screen. The 12-inch diameter DISCO-VISION disc is made of plastic sheet, typically mylar, is .010-inch thick, and provides full color / black-and-white, high-resolution pictures for a minimum of 20 minutes and a maximum of 40 minutes playing time per side. The disc, which closely resembles an ordinary long-playing phonograph record, is pressed in essentially the same way and is virtually indestructible, thus providing easy distribution by mail. It is metallized to permit handling with no more care than that required of regular phonograph records. It has its own plastic tray container so that the disc can be inserted into the changer without physical contact. This tray is 12½ inches x 12½ inches x ¼ inch. The disc is recorded on one side only. The program material appears on the disc in the form of a spiral running from the outer diameter of the disc inward with a pitch of 80 micro-inches per revolution. Density is 12,500 tracks per radial inch. The disc revolves at a rate of 30 revolutions per second and is played back by a laser beam. This beam is electronically steered to follow the recorded information spiral without making contact with the information track itself. The non-physical contact playback system eliminates record ware and provides an unlimited disc-playing life with proper user handling. DISCO-VISION discs will be housed in a plastic changer-compatible tray enclosed in a cardboard sleeve container. These albums will be available in several versions, typical of which are 12½ inches square and 3/8 inch thick for single discs, and 12½ inches square and ¾ inch thick, holding five discs capable of 200 minutes of playing time. Recording on only one side of the disc allows play of the complete album without an interruption to turn over the stack. The single and multiple disc albums are designed to sell for suggested list prices of $1.99 to $9.95 each depending on content, length and subject. 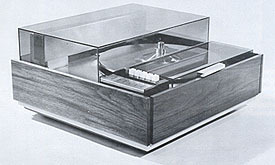 The DISCO-VISION multiple-disc player/changer is a covered unit of metal construction with walnut grain finish and smoked plastic cover. It permits the user to stack up to 10 discs for a playing time of up to 6-2/3 hours and can play pre-recorded information source material in either color or black-and-white in an unlimited number of standard television receivers or monitors simultaneously when fed by an appropriate distribution amplifier. There are six push-button controls [Power, Play, Stop, In, Out, Reject] on the front of the machine which are accessible with the lid closed. The dimensions are 22¾ inches wide x 18 inches deep x 11 inches high and the weight of the unit is less than 50 lbs. It is expected to retail for under $500. The unit's capability is such that at the touch of a control the action can be "frozen" and held or repeated over again or short sequences can easily be selected and played at will. There is also a single-disc player [image on the right] with dimensions of 16¾ inches x 18 inches x 8½ inches, weighing less than 40 lbs. Its design is similar to that of the multiple-player unit, and it is expected to retail for under $400. The DISCO-VISION multiple-disc album will be placed on the player/changer and discs automatically loaded onto the player turntable, played in sequence and returned to the album. It is slot-loaded with a flexible disc on its tray inserted, played automatically and ejected in its tray. The change time from record to record is approximately four seconds. Smaller albums and/or single discs may be loaded and played in any combination or order and may be added to the unplayed stack and withdrawn from the played stack at any time. The DISCO-VISION format is standard NTSC 525 lines, 60 fields. The disc drive speed is 1,800RPM, and there are more than 300 lines of horizontal color resolution. Audio and video signal-to-noise ratios are each greater than 40 dB. Two channels of audio are available for stereo and special applications. The DISCO-VISION playback laser is an inexpensive, low-power one milli-watt unit and has an expected useful life of approximately 9,000 hours, or approximately five hours of playing time per day over a five-year period, which is far in excess of the useful life of pressure systems employing magnetic heads or diamond stylus pickups. After 9,000 hours, it can be replaced simply and quickly. Since the laser playback system is electronically steered to follow the information track, it may be programmed to read the same track innumerable times, providing stop action or freeze frame, with no wear imposed on the re-read information track, and with precise selection of the information to be re-traced. The laser light reflected from the information track of the disc provides the information for the audio and video program as well as for maintaining the laser beam on the track. Motion picture film may be fed directly into the DISCO-VISION mastering machine from a film chain or may be transferred to a professional magnetic video tape which is then played into the disc mastering unit. Mastering from tape, film or live sources is accomplished in a real time process using laser and electro-optical modulation techniques for full bandwidth and fidelity. The disc is subsequently processed to produce a nickel-plated stamper from rich replica discs are produced. The recorded program material is reproduced on DISCO-VISION discs by a variety of processes. Stamping or embossing sheet mylar is typical, using heat and pressure to deform the surface of thermoplastic sheet material. The plastic is metallized to allow handling for playing on single-disc player models. Replication cost is less than 40¢ per disc (not including cost of program material). The DISCO-VISION disc has the highest information density ever achieved on any medium. It is capable of storing approximately 40 billion bits per 12-inch disc. Random (fast) access to stored information is permitted by radial traversing of disc. The random access capability is accomplished automatically by use of the "in" and "out" mode control push button of the player unit. The rate of reading recorded information is greater than 30 million bits per second with the capacity to show in excess of 35,000 slides per disc. The system permits, in addition to random access, program speed-up, slow-down, stills, reverse, or picture-by-picture replay. MCA DISCO-VISION has what it believes to be truly inventive solutions to the problems of recording sight and sound information on a disc, replicating the disc and playing back the replicas. The company is confident it has made several "breakthroughs" in video player and video disc technology which give it substantial competitive advantages. The master disc and the apparatus that will be used to produce it is one of these breakthroughs. Its techniques for taking that master and producing "stampers" therefrom and the techniques for maintaining the high information density in pressing the final record are also significant breakthroughs for which patent protection will be sought. MCA DISCO-VISION's playback system also includes certain special components. An example is a playback head system to automatically maintain the head-to-disc spacing and avoid scraping without the need to electrically servo or adjust this spacing. These component elements are protectible. In addition, the company has its own specially developed and unique tooling which is involved both in processing the initial laser-produced master through to the final disc replication stage and the specialized tooling relating to the alignment and optimization of the player equipment. The company also has some innovative electronic techniques for coping with many problems associated with storing information on a disc. These techniques and tooling will give DISCO-VISION cost advantages over competitive systems. MCA DISCO-VISION researchers have developed several options from which to choose a complete system. The company has inventions related to each of the options. For example, since the company has a choice between a rigid replica disc and a relatively flexible replica disc, it also has pick-up heads designed to work with each. Similarly, if the final disc is to be opaque only in the non-information areas, the company has patents to cover such a disc, and several methods of making it. If, on the other hand, the entire disc surface has the same degree of transparency or reflectivity, the company expects to be able to protect that disc as well. To retain these advantages, MCA DISCO-VISION, INC. has established certain information disclosure parameters in the proprietary areas beyond which the company does not find it prudent to elaborate publicly at this point in time. However, it can be disclosed that the company holds six issued patents. Several additional applications for patent are currently pending. Still other inventions have been disclosed, applications for which are currently in preparation. Those patents, along with the company's other proprietary rights, establish conclusively that MCA DISCO-VISION, INC. has created a video disc system from start to finish, from the making of a master to the playback of a replica disc. A great deal of sophisticated engineering technology and dedicated work of talented scientists have produced the MCA DISCO-VISION system. To the extent these breakthroughs can be protected by the United States' patent system, they have been or will be so protected. To the extent that the company will be able to maintain trade secrets on the non-patentable items, the company will rely on that protection as well. Low-cost replicated disc - under 40¢ per disc (not including cost of program material). Extremely high density information storage - approximately 40 billion bits per 12-inch disc. Ability to freeze frame - or repetitively read out a selected information track. Random access to stored information - by radial traversing of disc. High rate of reading recorded information - greater than 30 million bits per second. Search out - fast forward switch. Tens of thousands of single tracks of printed-page facsimilies may be stored on a single 12-inch disc. Large numbers of books or catalogs could be stored on records where many copies of each are required for wide distribution. Read-out would be accomplished by a player that continuously scans the selected track or page and displays it on a cathode-ray tube. Conversion to paper from cathode-ray tube presentation could accomplished via a copy machine. Audio-visual educational material could be presented on a standard TV receiver using the DISCO-VISION system. The video disc has the ability to store multiple-answer material which can be selected at will. When this is used in conjunction with minimal data processing equipment, educational question and answer routines employing this "branching" and "sub-routine" capability could be continuously feed back a program of appropriate audio-visual material predicated upon the students' response to initial presentations. The inexpensive nature of the replicated disc and the ability to store substantial amounts of information on a small disc provide an inexpensive mailable storage medium which could be distributed in quantity (on a weekly basis for example). The disc would contain up-to-date credit information which would be locally accessible in a matter of seconds using inexpensive office-installed machines. For example, more than 400 million nine-digit numbers (such as Social Security number) could be stored on a single 12-inch disc, with three-fold redundancy for accuracy. Material for widely-used television programs currently distributed in the form of photographic film prints or magnetic tapes could be distributed on MCA DISCO-VISION video discs. The ability to lock onto any given point or frame within the program permits precise and easy cueing and insertion of commercials and other program material. The non-contact playback system insures long life and consistent high quality.